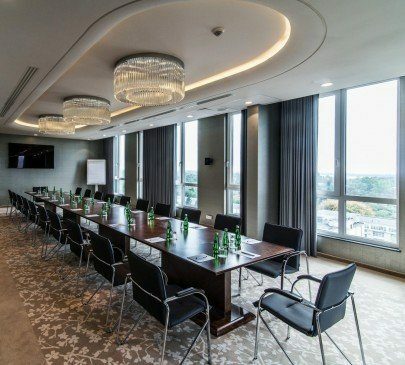 The interiors of the Airport Hotel Okęcie invite you to organize various types of meetings and events. 17 halls with modern equipment enable the selection and optimal arrangement of space for the needs of small meetings, such as recruitment interviews, through galas for up to 400 people to conferences holding up to 750 people. Mobile wall systems provide even more flexibility and allow adapting the hall even during a meeting. The success of the perfect gala is made of the prestige and comfort of the place where the gala occurs, in addition to noble guests. The hall arrangement at the Airport Hotel Okęcie allows organizing these types of meetings on several levels with the transmission of video and audio from the main hall at the same time. The flexibility in arranging the halls’ space, modern technology and decorations make the place tailored for a specific event, thus, it becomes unique in the perception of guests. The elegant and modern interiors of the Airport Hotel Okęcie have been designed to meet the specific requirements of organizers of various types of events. They can be, i.e., fashion shows – the size and height of halls enable setting of the models’ catwalk and suspending lights, or sports events, such as a fencing tournament or a boxing gala. The hotel is also the perfect filming set – a convenient place for shooting film and photo sessions – business and private, which immortalize important events such as weddings and other special events in beautiful arrangements. A spectacular view of the city and the airport infrastructure constitute a unique background and provide additional creative options. Business meetings are often crowned with an evening banquet. Both halls and restaurants at the Airport Hotel Okęcie provide arrangement options to convey the nature of the entire event. Also, our customers appreciate the original kitchen run by excellent chefs who improve their knowledge and skills in international markets as well as learn from the best master chefs around the world. Their skills are confirmed by numerous certificates and prizes, especially the praises of our guests. 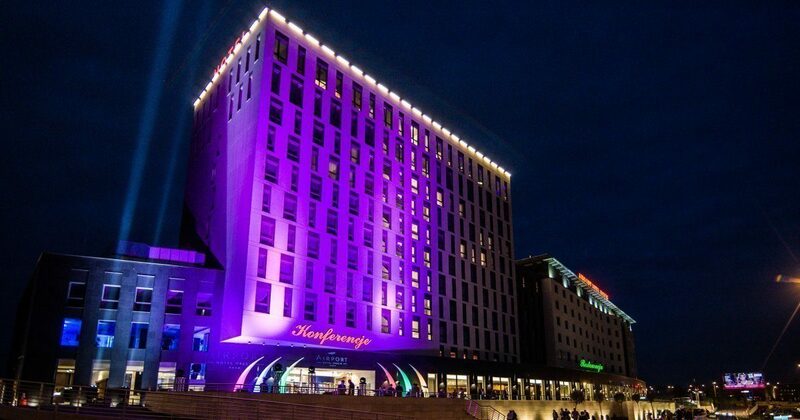 The Airport Hotel Okęcie is a surprising place with a thrilling atmosphere and an extraordinary team who watch over every aspect of implementation. We follow the principle of ‘all you need is here’ ... an Escape Room, a disco with a panoramic view of Warsaw and the airport, an outdoor grill and a highly energetic garage party. Everything in one place... Seems impossible? Schedule your event with us and relax. Let us take care of the organization.